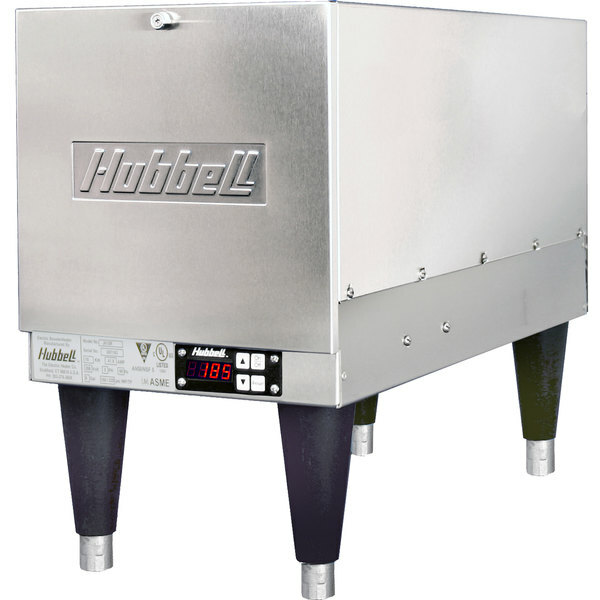 Ideal for providing 180 degrees Fahrenheit in your commercial kitchen environment, this Hubbell J67R 6 gal. compact booster water heater is the perfect solution to ensuring that your kitchen tools, china, glassware, and more are safe and sanitary after washing! The all stainless steel tank construction does not require an internal lining and this item is certified to have a low lead content to ensure the safety of your customers and employees. The tank's ASME stamped construction allows for an extended tank life to make sure that your booster heater will last for as long as possible, preventing downtime and extra expenditures down the line. In addition, the stainless steel exterior jacket and base keep this booster heater protected and free from corrosion. This booster heater is designed to be easy to use and maintain. No electrical components need to be removed in order to replace or repair other internal components. Plus, the screw plug elements are easy to service compared to less reliable flange heating elements. Installing this booster heater is also easier since it is designed with dimensions and connection locations similar to other brands, reducing the chance that you will need to replace existing plumbing when you replace your booster heater. Requires a 208V / 3 phase electrical connection. 19 amps. 7kW. Height (including legs): 19 3/4"